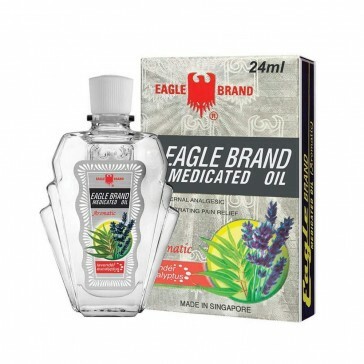 Eagle Brand Medicated Oil (Aromatic - Eucalyptus & Lavender) , is a relatively new blend added to the popular eagle brand 50+ year lineage. It is used for the temporary relief of minor aches and pains of muscles and joints associated with backache, arthritis, strains and sprains. Also reaps the many therapeutic antibacterial benefits of eucalyptus and soothing fragrance of lavender aiding in relaxation. Licenced & registered for Australian distribution - AUST L 268898.